Beckett is unhappy; alone, depressed and rudderless. He meets Eddie, who provides sanctuary for a while. However, just as Beckett is finally working out some of the fundamental issues which have plagued him for years, he is abandoned again. His only option ... to cross the river to the city on the other side, where no decent folk go. 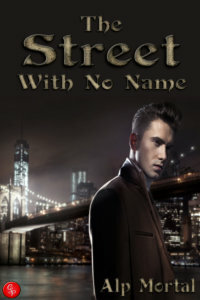 The Street With No Name is the fifth instalment of The Tales of the Unexpected, a series of short unrelated stories with surprising endings.